A city that lost its drinking water system is struggling to restore service and a crippled chemical plant that twice has been the scene of explosions remains a concern nine days after Harvey ripped across Texas. Officials in Beaumont, population almost 120,000, worked to repair their water treatment plant, which failed after the swollen Neches River inundated the main intake system and backup pumps failed. The Army Corps of Engineers sent pumps, and an ExxonMobil team built and installed a temporary intake pipe in an effort to refill a city reservoir. Exxon has a refinery and chemical plants in Beaumont. In Crosby, outside of Houston, authorities continued to monitor the Arkema plant where three trailers of highly unstable compounds ignited in recent days, sending thick black smoke and tall flames into the air. A Harris County fire marshal spokeswoman said there were no active fires at the facility, but six more trailers were being watched. The soggy and battered city of Houston began burying its dead and taking steps toward the long recovery ahead. Friends and family gathered Saturday in Tyler to remember a former Texas high school football and track coach whose body was found Monday. Hurricane Harvey caused record flooding across the Houston area. Comparing photos from before the storm show dramatic changes. The storm is blamed for at least 44 deaths. Also, fire officials in the community of New Waverly, about 55 miles (88.5 kilometers) north of Houston, said a 6-month-old baby was missing and presumed dead after being ripped out of its parents' arms and swept away by floodwaters, the Houston Chronicle reported. Houston's school district said up to 12,000 students would be sent to different schools because of flood-damaged buildings. Harvey flooding is believed to have damaged at least 156,000 dwellings in Harris County, which includes the nation's fourth-largest city. Kim Martinez, 28, waited Saturday for insurance adjusters to come to her Southbelt/Ellington neighborhood, a devastated middle-class area of southeast Houston. "You can be prepared for anything but not a monster storm like Harvey," said her mother, Maria Martinez, 63. Some were able to count their blessings even as they faced a daunting recovery. "I'm just praying on some help right now so I can get this over, behind me and try not to think about it," said Georgia Calhoun, whose family is sleeping on air mattresses inside her damaged home after taking ruined furniture to the curb. Not everyone was able to think about rebuilding yet. About 200 people waved signs and shouted as they rallied Saturday outside a still-flooded subdivision in the west Houston suburb of Katy, demanding answers about when they will be able to return home. Houston Mayor Sylvester Turner has warned residents that their homes could remain flooded for up to 15 days because of ongoing releases of water from two reservoirs protecting downtown. Turner on Saturday ordered mandatory evacuations for an area that's been inundated by water from the reservoirs. About 4,700 dwellings are in the area, and Turner said about 300 people have refused to leave. The school district assessed its own losses. Twenty-two of its 245 schools had extensive damage that will keep them closed for months. Though school is now set to start on Sept. 11, that could change. 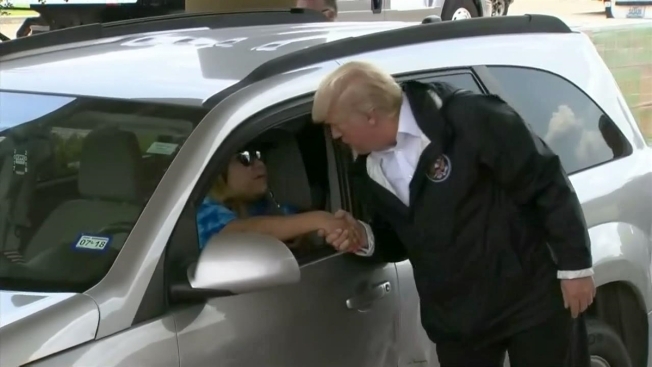 President Donald Trump arrived in Houston for his second visit to the devastated region. He and first lady Melania Trump met with Harvey evacuees taking shelter at the NRG Center in Houston, where they spent time with children and helped to serve food. Later, they helped load trucks with relief supplies at a church in suburban Houston. They also visited Lake Charles, Louisiana, to survey damage. About 1,000 evacuees remained at the George R. Brown Convention Center, down from a peak of about 10,000, city officials said. Trump has asked lawmakers for a $7.9 billion down payment toward Harvey relief and recovery efforts — a request expected to be swiftly approved by Congress, which returns to work Tuesday after its summer break. Harvey came ashore Aug. 25 as a Category 4 hurricane, then went back out to sea and lingered off the coast as a tropical storm for days. The storm brought five straight days of rain totaling close to 52 inches (1.3 meters) in one location, the heaviest tropical downpour ever recorded in the continental U.S. National Weather Service meteorologists expect what's left of Harvey to break up and merge with other weather systems late Saturday or Sunday. Another storm was churning far out over the Atlantic. Hurricane Irma was on a course that could bring it near the eastern Caribbean Sea by early next week. The Category 2 storm was moving northwest at nearly 13 mph (20 kph). No coastal watches or warnings were in effect.